Tired of the same old cheesecake recipe? These three versions use blue cheese, havarti and gouda for a brand new spin on a classic cheese recipe. Who doesn't love cheesecake, with its creamy texture and over-the-top taste? 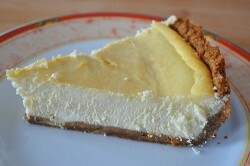 While most cheesecake recipes are rather basic with chocolate or cream cheese, you can make all kinds of unique cheesecakes by swapping out the traditional ingredients for havarti, gouda and goat cheese. If you want to try something a little different, give one of these yummy cheesecakes a try at your next party or family get-together. This recipe is simply the most amazing way to enjoy blue cheese. It's also super easy to make so it's a good weekend dessert for the family. 1. Beat together the first two ingredients until fluffy, around five minutes. Add in the next two ingredients, incorporate, then add the eggs slowly, mixing after each egg. 2. Pour into a prepared springform pan and bake for around 1 hour. Remove and let stand for at least 5 minutes. 3. Spread the rest of the sour cream on the top, bake for an additional 5 minutes then cool completely and refrigerate over night. This decadent cheesecake doesn't hold its shape well, so it's the perfect spin on a dip for crackers and fresh fruit. If you have a little time on your hands, try making the yummy pecan and brown sugar topping for it, too. 1. Combine the first three ingredients in a large bowl using an electric mixer. Once everything is incorporated, add the remaining ingredients and mix well. 2. Pour into a tart shell and bake at 350 degrees F for 35 minutes. 3. To prepare the topping, melt 1 tablespoon of unsalted butter. Add 1 thinly sliced granny smith apple and allow it to brown. Season with kosher salt and cook an additional two minutes. Add half of a thinly sliced pear and 1/2 cup chopped pecans. Add another dash of kosher salt and toss to coat. Once browned slightly, add in 1 tablespoon of brown sugar and toss again. Allow to carmelize, then turn off the heat. This cheese recipe also produces a cheesecake that's very soft and ideal as an appetizer or dip. It's definitely worth the effort! 1. Start by making the crust. Combine the crushed crackers and butter then press into a 10" springform pan. Bake for 10 minutes at 375 degrees and set aside. 2. Beat the cream cheese in a large mixing bowl, then add in the whipping cream, tomato liquid and eggs, one at a time. Beat again until well incorporated and creamy. Add the remaining ingredients and blend. 3. Spoon the mixture over the crust and bake for 45 minutes, or until set. Loosen cheesecake from pan and allow to cool on a cooling rack. Cover and refrigerate overnight, or for at least two hours.